Oil pressure gauge, also known as seismic pressure gauge or anti pressure gauge, commonly known as hydraulic gauge or oil-filled gauge. 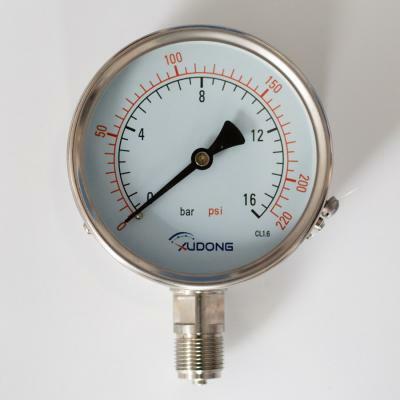 The accuracy grade of pressure gauge is to reflect the comparison between checklist and precision gauge, the exact degree that indicates that the indicated value is close to the real value. It is equal to the percentage of absolute value of the maximum basic to the the upper limit of the measurement, which is based on the size of the error generated by the calibration to decide. China's general industrial pressure gauge is divided into four levels of accuracy, the four levels of accuracy are: level 1, level1.6, level 2.5, level4. The allowable error, calculated as a percentage of the upper measurement limit, is ± 1%, ± 1.6%, ± 2.5%, ± 4%, respectively. Reasonable choice of pressure gauge accuracy grade method should be based on the production process, economical and practical, testing methods and other requirements. According to the tolerance of the minimum pressure, the accuracy level is to be selected.